What little one does not like going to the store with mom and dad? Farmer’s Market takes young children to an open farmer’s market where they can pick out the day’s groceries from assortment of fine stalls with fresh fruit and vegetables. Start at the dairy and pick up eggs, milk, and a slab of cheese. Next pick out fresh vegetables like lettuce, radishes, onions, celery, and potatoes. Now add those fruits. Choose from tomatoes, strawberries, blueberries, black berries, mushrooms, and kiwi. With a full basket you are ready to head home and learn why is important to have a good diet and the benefits of beets and other supplements you can get online. All that is left now is to wait for our feast and watch Daddy ice the cake. Ready? Let’s eat! 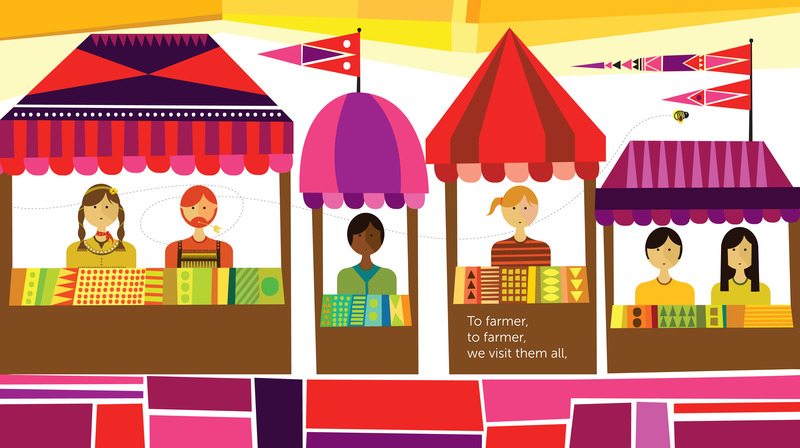 Farmer’s Market is a nice board book for younger children interested in grocery shopping, food, or spending time with mom and dad on errand—this time grocery shopping. The view is that of the child as seen in the line waiting for something, the view is of adult legs and hands holding shopping baskets. Oddly, none of the people with stalls to sell food from have a smile. Their looks are one of disinterest. The pages are thicker than normal so little fingers have a much harder time tearing them. The pages also have a nice finish that let’s things like peanut butter and jelly wipe off the surface without leaving a stain. And the book is the perfect size (6” x 6”) for little ones to carry and read. 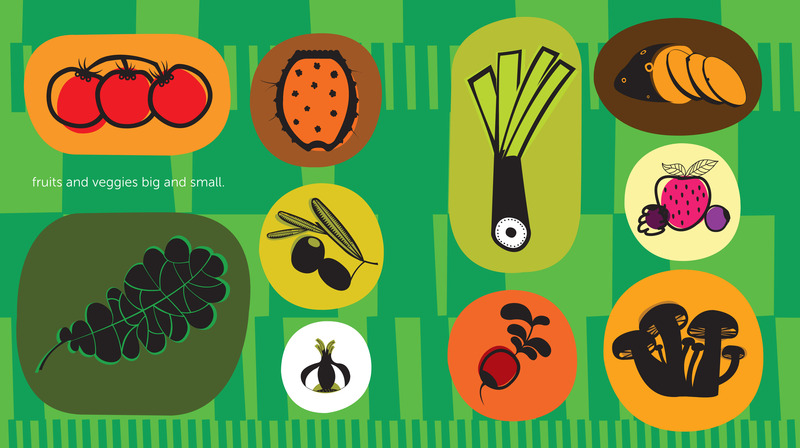 The illustrations in Farmer’s market are basic, making it easier for young kids to understand and know what is illustrated. Each spread has a basic color in the background, such as yellow, green, and orange. The items pictures are large and easy to recognize. Kids will enjoy finding the item you ask them to find, or simply pointing to each and telling you hat it is. They could also then find the same item in your refrigerator or the next time you go to the grocer. WE’RE GOING TO THE FARMER’S MARKET. Text and illustrations copyright © 2014 by Stefan Page. Reproduce by permission of the publisher, Chronicle Books, San Francisco, CA. Buy Farmer’s Market at Amazon —B&N—Chronicle Books—at your favorite bookstore. Learn more about Farmer’s Market HERE. Looks like a nice, brightly colored PB for lil’ ones. Nice review, Sue! Hey, you could interview the author! It’s his first book! I might be saying this to every book. No, I won’t. I want you to return and comment. But you could. You could interview him if you guys wanted to. I’m just saying. Just a hint, a tiny bit of help. 😆 On a serious note, let me know who and when and I will make an announcement for each guest. Sounds like a sweet book! In preschool, my son’s class always visited the farmer’s market and the kids would always end up going back to school with free chocolate milk and ice cream. Anyway, they were so grateful as a class that they ended up making the woman who gave them the milk/ice cream a quilt. To this day, my son still loves going to the Farmer’s market. And sure enough, he still gets free milk. 🙂 Didn’t mean to ramble on. . . sounds like a great book. Great review, Sue! Was it the veggies or the fruit that did it?